Mai Thai Wellness Spa takes its name from the Thai word “mai” meaning “essence of”. 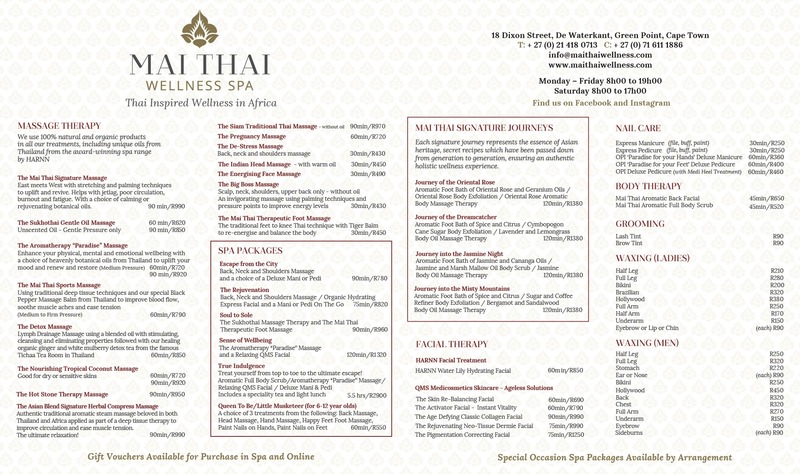 It refers to our ethos of Thai Inspired Wellness in Africa, harnessing the best of both worlds of healing and heritage. It is also a word in reference to silk and the ancient silk roads that defined Thailand’s exotic history. Our highly trained therapists are from both South Africa and Thailand, providing spa therapies from an array of outstanding East meets West massage options, rejuvenating facials as well as expert manicures, pedicures and waxing. Enjoy signature spa treatments using top international products including HARRN Thailand, Bellabaci, QMS, OPI and Cirépil by Perron Rigot. We ensure you receive the perfect treatment for your individual requirements through an interactive consultation process. You will love our relaxing Day Spa inspired by the colours and textures of Thailand and Africa. We provide a welcoming ambience for guests escaping from the city’s hustle and bustle. The spa has five elegant pared down treatment rooms (two of which can be made into couples rooms). You will find high quality percale linen, palm leaf fans, delicate essential oil scents as well as decorative pieces, travel books and rich fabrics handpicked by the spa’s owner. Ensure you leave enough time after your treatments to relax in the spa’s beautiful garden courtyard complete with the indigenous Portulacaria, also known as the ‘Spekboom’, the wonder tree native to South Africa. Enjoy a cup of our delicious organic tea from the famous Tichaa Tea Room in Thailand.